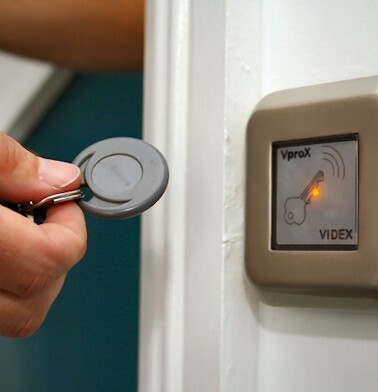 Serv Security’s access control capability ranges from card access systems to intelligent keys, from large corporate multi-site systems to stand-alone doors, utilising the latest technologies, including Smart Cards and biometrics, to ensure we meet customer-specific needs and requirements. With a product suitable for every application, whatever your access control needs are, Serv Security can help. Many entry systems - barriers, gates, turnstiles, road blockers or simply just doors - are now connected to PC-based systems to protect office equipment and expensive devices using audit trails to restrict access and log movements. Door entry intercom systems are an essential part of the security protecting your premises, the security of buildings has never been as vital as it is today. The right entry system can provide you with peace-of-mind by being able to remotely communicate and identify visitors safely. Serv Group also supplies photo ID card printers, ID card printer ribbons and all associated accessories. We supply products to suit all budgets and requirements - from custom-printed lanyards to a fully integrated ID Card Printing system. (Access Integration or Standalone Software available).